The arrows point to the tracks of the cambium miners. 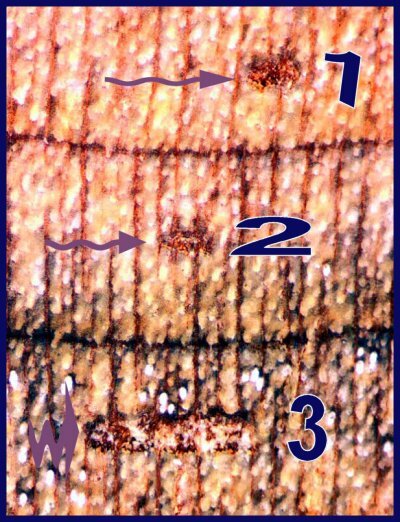 You see three growth increments in a cross section or as we call it "Transverse". Here we see 3 increments - 1-3. As that increment was growing and the cambium zone was located in that spatial position, the Miners swam through, in a sense leaving these markings. They went through as the tree was going from spring wood to summer wood. 1-3 are cambium miners tracks. Not harmful to the single tree or the system.